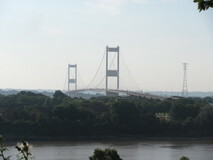 The previous section in June from Cardigan to Llanelli had left only 280km (174 miles) to reach Chepstow and complete the whole path. I had originally planned to finish it off in September, but as luck would have it I was between projects at work in July, so I took advantage of the temporary lull and got a week of vacation booked for the middle of July. 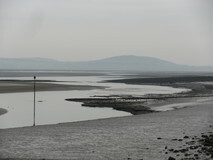 The travelling required a slick operation, to get back to my previous finish point of Llanelli without wasting too much walking time. After a rather hectic day at work getting everything finished off, I managed to slip away early, and four separate trains finally got me to Llanelli for half past nine where I had a B&B booked all of 30 seconds walk from the station. It only remained to pop out and get a Chinese takeaway from a place across the road. My sleep was a bit broken up by some commotion in the middle of the night, which in the morning turned out to be somebody who had arrived at 2am without warning the B&B in advance, and then seemed surprised that he couldn't get in. Despite that, I woke up before the alarm went off, and a short stroll had me back at the coast path near North Dock just before seven. It was a fairly dull morning, although mostly dry apart from some occasional drizzle which didn't last long enough to bother putting waterproofs on. The route followed a cycle path past fairly new looking sea view houses clustered round small bays that had been constructed. 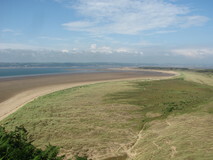 There were tantalising views across to the Gower, and the Whiteford lighthouse. I arrived at Pen Clawd just in time for elevenses, and I adjourned to a pleasant little cafe for beans on toast with hash browns, and a pot of tea. 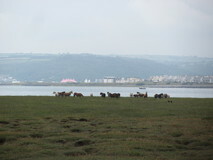 After leaving Pen Clawd, the route turned into a rather derelict looking industrial estate, but then quickly turned off and joined a path skirting round Crofty, right on the edge of the salt marshes, with good views back across the water to Llanelli. The path got back to the pub in Crofty just as a bride and groom were climbing into a white carriage drawn by two horses, and they set off along the small road across the marsh. 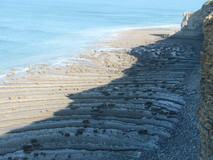 The coast path also followed the small road, with occasional signs warning walkers that the road was sometimes flooded at high tide! A pleasant stretch after Llanrhidian, through grassy meadows filled with butterflies and bees, led to a handily placed bench where I sat down for a short snack. The sun had even come out by now, which was a nice surprise, as apparently most of the UK was under a deluge of torrential rain. 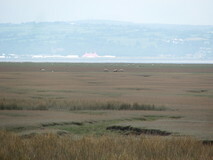 There were good views from the bench, back across to Llanelli, and the grasses growing on the marsh gave it an orange glow. The rest of the route, all the way to the campsite near Cwm Ivy was absolutely superb. 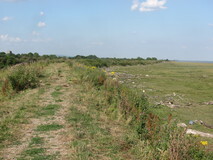 A stretch of rough track right alongside the marsh led to Burry Pill, where a small embankment went across to the Whiteford nature reserve. Here there was a junction, and the wooden signpost under a large pine tree gave the choice of doing the circuit of the nature reserve, out to Whiteford Point, or cutting it off and going straight to Cwm Ivy. I plumped for the Whiteford Point circuit, which turned out to be excellent. 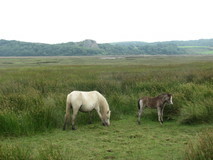 The path went beside the marsh, through bushes, patches of yellow irises, pine trees, and occasional marsh horses before popping out at a superb deserted curving beach near Whiteford Point. 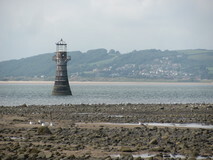 I took the short detour out to look at the old rusting lighthouse, which had been luring me on since way back before Pembrey Forest, on the previous trip. 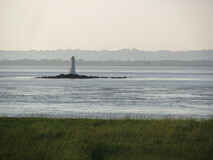 The lighthouse wasn't completely above the water, but I was able to get quite close and have a reasonable look at it. 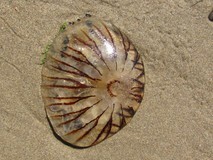 It was quite warm in the sun by now, and I pushed on along the long beach, which was almost deserted. I arrived at the campsite near Cwm Ivy at about half past five. Despite it being a Saturday, there was plenty of space, which the campsite person put down to everyone being scared off by the forecast of torrential rain. It was a nice sunny evening, and after pitching up I got a large pan of tea on, followed by instant noodles with added baked beans. I was woken up by the sun before the alarm went off, and was back on the path by ten to seven. It was dry, but a bit cloudy. 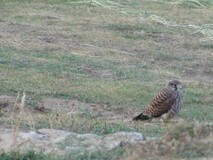 Near Spaniard Point I got quite close to a Kestrel that was sitting on the path. 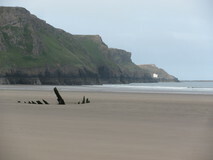 I had thought about taking the hills that overlook Rhossili beach to get some good views, but the tops were all in cloud, so I pushed on along the beach instead. 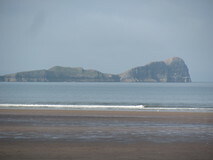 There were great views of Worms Head snaking its way out across the bay. As I walked along I came across large piles of razor shells scattered across the sand. I made it to Rhossili for nine o'clock. I was looking forward to a cafe for breakfast, but there didn't seem to be anything open, so I sat down on a bench and had a muesli bar and some nuts instead. 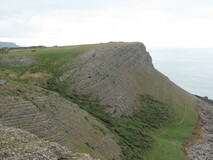 Leaving Rhossili, there was an easy wide grassy path out to the point, followed by a good stretch passing lots of limestone cliffs, and occasional steep-sided valleys leading down to the sea. The clouds had disappeared by this point, and it was getting quite hot in the sun. 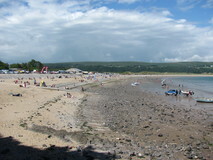 After the quiet paths, Port Eyon was a bit of a contrast, it was heaving with people. I got a vegi burger from the cafe, and sat inside to get a break from the sun, which was actually nice and quiet, as everyone was sitting outside. 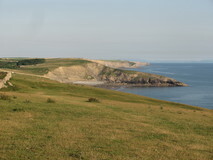 From Port Eynon the path went alongside small dirt cliffs leading down to sea, sometimes hemmed in by field fences on the inland side. 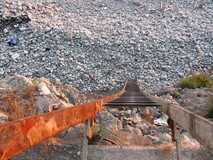 At one point there was a short inland detour to get round a section where the dirt cliffs had collapsed. 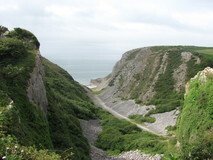 Further on the walking was along wide grassy path, with small limestone cliffs on the inland side, high above the sea. There were very few people on this section. 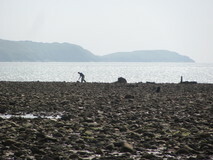 Nearing Oxwich Point, views opened up of industrial works on the coastline, way off in the distance, with smoke plumes rising from chimneys. 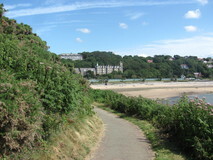 The last bit to Oxwich was through a pleasant forest, that was nice and cool after the heat of the sun. 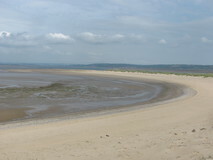 Oxwich was another busy beach, with a parking area on the beach itself, and I adjourned to a small snack bar for some cold drinks, and filled up my water bottles at the WC. The final section went through sand dunes in a nature reserve, on a soft sandy path, before crossing a stream on a small wooden footbridge. Nearer to Three Cliffs Bay, there was some climbing, and near a big swing hanging from a tree I got a bit confused about the directions and ended up doing a short loop back to path that I had already done. 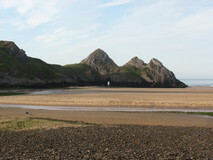 The second time round I found the correct path which took me to a headland where there were superb views across Three Cliffs Bay. There was a final sting in the tail of a steep ascent from the beach to get up to the campsite, and I finally arrived about half past five. It was a nice site, although a bit pricey, and the person on the desk found me a quiet spot at a corner of a field. The last stretch had been very hot, so before heading off to pitch up I got two cold drinks and polished them off. There were already blue skies and sunshine when I woke up and poked my head out the tent, and I got packed up and was back down the hill at the beach just after seven. 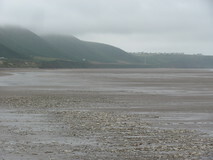 The path climbed up from the beach on very soft sand, but soon became more grassy. At Pennard there were a load of bulls who seemed to have free reign of the area, they were wandering around next to peoples front gardens, and rubbing against garden walls and parked cars. 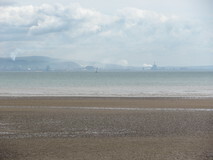 At Pwlldu head, views reappeared of the coastline way off in the distance, with various industrial looking chimneys. I sat down on a step on the path and had a muesli bar and some nuts and raisins for breakfast. 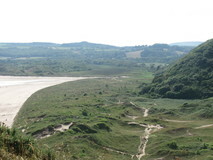 Pleasant walking, through thick ferns and bushes, and occasional small bays took me Caswell Bay, where someone was just taking off in a helicopter and heading out to sea. There was a nice little cafe right on the edge of the beach, so I got a pot of tea and a spicy vegiburger. 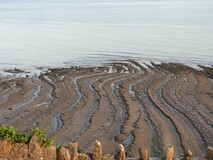 From Caswell there was a concrete path that traversed the hillside, before popping out at the Mumbles. 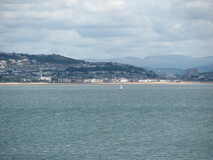 I pushed on along the promenade, with great sweeping views of the whole of Swansea Bay, all the way to central Swansea and beyond. 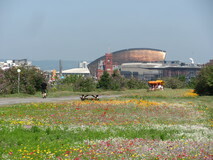 The promenade turned into cycle path that was hidden from the road by trees and a stretch of grass. There were lots of cyclists out, and in the warm sunshine it felt quite continental! I stopped at a bench half way along for a snack, and laid out the tent to dry out in the sun. Near the civic centre the path left the road, and skirted lots of new looking waterfront flats. A young chap went past on a skateboard while strumming an electric guitar, which seemed like a precarious activity. 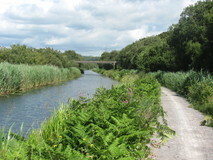 The path arrived at a bridge over the River Tawe, which had a section that opened up to let boats pass through. There was a small cafe overlooking the bridge, and I stopped for a quick lemonade followed by a pot of tea, while watching the occasional boat come through. 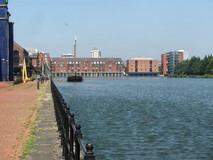 After crossing the bridge, the path skirted round the Prince of Wales dock, then a short walk next to an A-road led to a park and ride car park. The path then went along the Tennant Canal for a short stretch, which was pleasant in the sun, lots of reeds rustling in the breeze, and deserted, I only saw one single runner along here. After the canal the route followed a cycle path which ran alongside a busy A-road, which was rather dreary, especially in the heat of the day. At least there was a petrol station near the start though, so I was able to get some cold drinks to polish off straight away, and top up my water bottles. After crossing a huge road bridge over the River Neath, with good views, I arrived at a junction, where there was a choice of the normal route, or the high-level variant. I had spotted the series of hills overlooking Port Talbot from the train on the journey down, and they looked like they would have some good views, so I went for the high-level route. 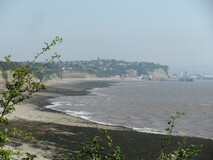 From the path junction the route soon turned off onto dirt path, which was a nice change after all the pavement walking and I re-extended my walking poles which I had packed away back at the Mumbles. After a nice stretch through trees, I went through a fairly quiet and tidy estate at Baglan, which was well signposted. The final bit of the day went up a small road, which eventually turned into forestry track and a long uphill pull which took me almost to the summit of the hill which overlooked Port Talbot. 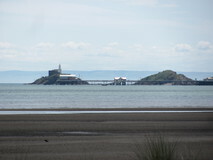 At the high point there were cracking views back across Swansea Bay to the Mumbles, which now looked a very long way away, and I could even see lights across the Bristol Channel on the coast of England. I cooked up some noodles for tea, which I ate sitting in the evening sun, and then pitched up in a nearby secluded spot after dark. I got going again at seven. It was a dry morning but cloudy overhead, and unlike most mornings all the grass was dry. 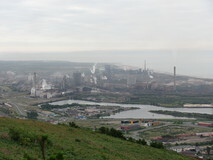 The path soon dropped down steep steps into Port Talbot. 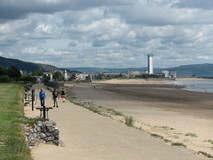 I was almost out of water, but in Port Talbot the path went right past a large supermarket so I was able to get a refill and stock up on food. From here the path traversed three separate hills, dropping down to houses between each. The path across the first hill was thick with tall ferns, it had almost been swallowed up in places, and I had to force my way through some bits. The second hill started off hemmed in between fences with thorny bushes encroaching from both sides that I had to carefully pick my way through, but then opened out a bit. About half way along I stopped and had a muesli bar and some nuts and raisins for breakfast, while surveying the view across the industrial works, and the noisy motorway below. The final hillside section was the best of the three, the path climbed right up to the brow of the hill, and walked along the top, past some old buildings that used to house World War II radar stations, with cliffs and thick forest below. The sun had come out by now and it was starting to get quite warm. The last bit of the high-level variant dropped through a lovely forest stretch, some deer ran off as I passed through, and the background noise from the motorway even disappeared. Half way down the path went right beside the ruins of the old Hen Eglwys chapel, which was surrounded by ferns on a small flat piece of hillside. After dropping down and crossing the motorway I rejoined the low-level route. According to the WCP website the next stretch was subject to a rather unpleasant looking inland diversion along an A-road, but there didn't seem to be much sign of this on the ground. I followed a narrow road back towards the sea past various industrial works, which eventually ended up at the beach, which I walked along. 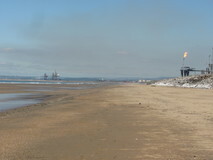 Despite being right beside all the industrial works, with large plumes of smoke appearing every so often, it was actually quite a pleasant beach. At one point there was a fairly shallow river flowing across the beach down to the sea so I took my shoes off and paddled across. Eventually I arrived at the Porthcawl golf course, where there was a Seniors championships underway, so quite a lot of activity. The coast path went along a fairly new looking boardwalk that skirted along the seaward side of the golf course. 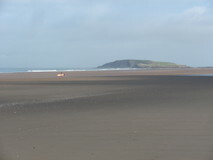 before arriving at Rest Bay, which was absolutely jam packed with people sitting on the sand, and surfers in the water. It was quite hot by now, and I was very low on water, so was relieved to find a drinking water tap where I drank a litre of water, and filled up my bottles. 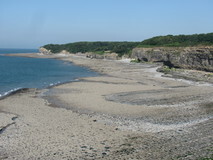 From the busy bay, there was still a bit of a walk to Porthcawl itself, along a pavement, and I arrived at about two o'clock. At the town I made use of the rather grand public toilets, stocked up on food, and had a snack sitting on some green seats that were part of a sculpture. It had clouded over a bit by now, which was actually quite a relief as it made the walking a bit cooler. 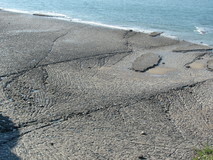 It seemed to take quite a long time to escape from the hustle and bustle of Porthcawl and get back on quieter paths. First the path went past the harbour, then inland past a small park, then back out to a lifeguard station, with lots of people going back and forth. Finally it went past a row of holiday chalets followed by a busy beach, where I had a couple of cans of cold fizzy drink from an ice cream van. The sun was back out again now and it was quite hot. 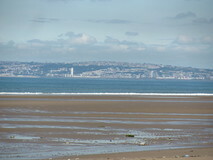 I pushed on along the beach, with views of Ogmore in the distance luring me on. 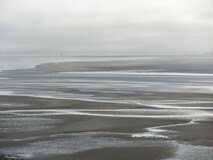 The beach eventually started to quieten off, which was a bit of a relief. About the half way along the beach there was a stretch where there were no people about at all, and I took advantage of the brief moment of solitude to have a quick skinny dip in the sea. I hadn't had a shower since the Gower, so it was really pleasant to submerge myself for a little while and wash away the stickiness. 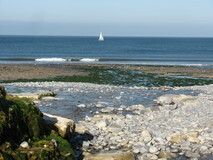 Refreshed, I pushed on toward Ogmore, and the end of the beach arrived, with Ogmore on the other side of a shallow river that was easily wadeable, but I resisted the temptation and stuck to the path as it headed inland. 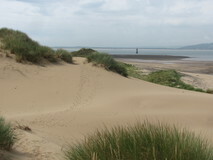 It went across some small salt marshes, then some very soft bits through sand dunes, before joining a small road at a car park, which took me to Merthyr Mawr, where there were a couple of nice thatched houses. 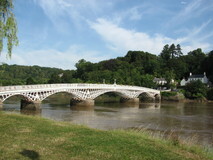 A couple of bridges then got me across two small rivers where I then headed back out towards Ogmore along the main road. The road wasn't too bad, there was only a small verge, but there wasn't much traffic, and half way along the path dropped down to the riverside which was pleasant walking across dry grass of the salt marshes. 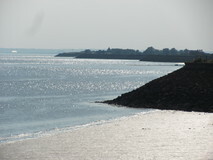 Just to rub it in, a whole family were wading across the river as I arrived at Ogmore, taking about two minutes to get across, compared to the inland trek that had just taken me about an hour in the heat! 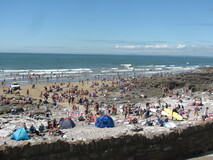 The car park overlooking the beach at Ogmore had a WC so I filled up my water bottles and pushed on. 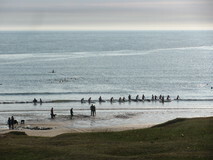 There were a row of people down on the beach having surf lessons, and doing the same actions almost in unison. From Ogmore the walking was absolutely superb, easy going on wide grass paths, with excellent views of limestone cliffs stretching off ahead. 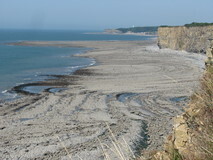 I reached Dunraven at about eight o'clock, there were quite a few people still on the beach, although it looked like the cafe had only just closed. A bit further on I was surprised to see someone coming up from a little valley leading to the clifftop, and a quick detour down the valley revealed a via-ferrata style ladder attached to the cliff. I climbed down the ladder to the boulder beach underneath the cliffs. it was about half past nine, and a nice spot to stop for tea, so I got the instant noodles on while enjoying the sunset, the views back to the streetlights of Porthcawl, and even some fireworks going off over Portcawl at about ten o'clock. 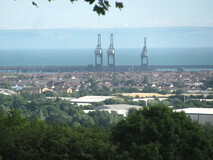 I also had a clear view across the Bristol Channel to the Somerset coast and streetlights from small villages. 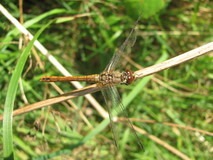 I pitched up nearby at about half past ten, in a secluded spot. It was quite breezy during the night, which had the nice side effect that there was no condensation in the tent, so it was completely dry when I packed it away in the morning. I was back on the path and on the move at seven. As I walked along, there were absolutely superb views of layered limestone cliffs, with impressive flat limestone platforms underneath. I had almost run out of water though, and further along there was a small stream that ran down to the limestone platform and I filled up a bottle and put a purification tablet in it. More easy walking led to the lighthouse near St Donat's Point, where there was a small building housing the large fog-horn, and you could see the various engines and compressed air cylinders and piping through the windows. 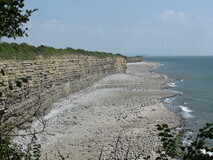 After more excellent limestone scenery, and the impressive buildings of St Donats school that went all the way down to the shoreline, I arrived at Cwm Col-huw, near Llantwit Major, at about ten. I was relieved to find a public toilet to fill up my bottles with fresh water, and replace the stream water, especially since it was quite hot and sunny by now. Even better, there was a small cafe so I popped in and got a late breakfast of beans on toast and a mug of tea. 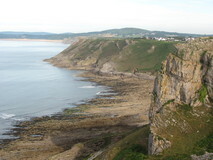 After the cafe, the path went along quite a few field edges, still with occasional views of the excellent cliffs and limestone platforms, before coming across the Seawatch Centre, based in an old coastguard lookout. The woman inside invited me in, and gave me a run down of the views out to sea, comings and goings in the Bristol channel, and a potted summary of the wildlife in the area. 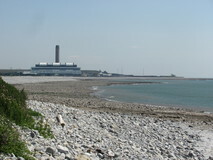 A little bit further on the path arrived at the rather futuristic looking Aberthaw power station, and the path skirted round the outside, hemmed in by the power station wire fence on one side, and concrete breakwater on the seaward side. 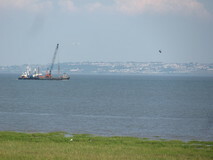 The plant seemed to be run on coal and wood chippings, which were stacked up in large piles. After the power station I continued alongside a concrete breakwater for a while, passing a small lake on the inland side, before climbing up to go through a static caravan site. In the heat, I was getting through the water quite quickly, and two women sunbathing in deckchairs outside their caravan very kindly topped up my bottles for me. 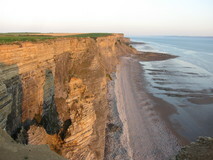 At Rhoose Point was a sign declaring it as the most southerly point in the whole of Wales. There was also a large inland pool which looked like an old flooded quarry, where lots of kids were throwing themselves into the water. 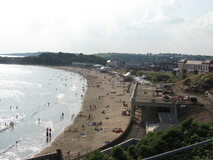 I soon reached the short causeway over to Barry Island, and headed off on the circuit of the island, passing some busy amusement and shops at Whitmore Bay, then to Neil's Point, where there some expensive looking houses with sea views, followed by terraced streets to get back to the causeway. Back at the start of the causeway it wasn't far to Barry High Street, and I arrived at about six. There wasn't much in the way of camping opportunities in the vicinity, either official or unofficial, but I did a little bit of research on the internet and found a room in a guest house that was only five minutes away. It was a nice tidy and clean place, and rather a bargain at only twenty pounds, especially considering I had paid fifteen pounds for some of the more expensive campsites! For tea I treated myself to a takeaway vegetable balti and dhal from a place on the High Street. I got a nice early start and was back on the path by quarter to seven. There were blue skies and sunshine, and it was already quite warm. I started off along some old docks, with new looking flats nearby, and a few people fishing. 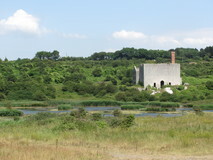 Then there was a rather less interesting section on pavement alongside A-roads, passing by Barry Power plant. 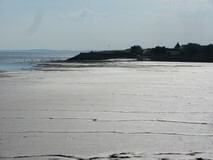 I finally arrived back at the coast near Sully at eight o'clock. I was quite glad I had got the A-roads out of the way early when there was less traffic around and before the full heat of the day. 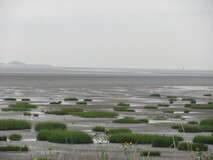 From Sully the coastline was pleasant enough, with occasional inland diversions to get round caravan sites. At Sully Island there were signs with dire warnings to not attempt to cross to the island when the causeway was submerged, and there was even a clock with a countdown to when it was safe to cross. 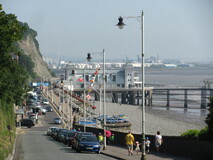 At Penarth the path dropped down to the promenade and walked along to the pier. It was about half past ten by this time, and I adjourned to a nice cafe on the pier for a pot of tea. I had just got sat down at the table when a woman came across to say that she had seen me passing Sully earlier while she was pruning her roses, and expressed surprise that I had made it here so quickly! 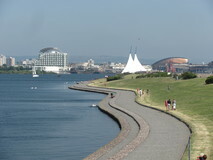 After a short stretch through Penarth residential streets, the path arrived at the Cardiff Bay Barrage. I crossed over and walked along the embankment. 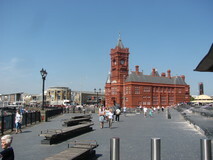 In the sunshine, with the superb views of the waterfront flats and buildings of Cardiff Bay, occasional water buses going past, and lots of families passing by on bicycles I felt like I could almost have been in Vancouver! 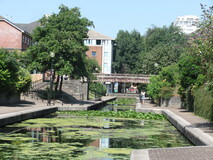 As I reached the city itself, the path passed the National Assembly building, then followed an old wharf, and some pleasant small canals with dragonflies hanging round patches of lillies. 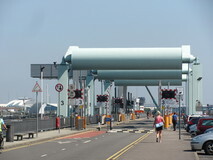 The final section out of Cardiff wasn't quite so good, following A-roads through out of town offices and depots. I was surprised to come across a Greggs along here, which seemed quite busy with workers from the surrounding offices. I stopped and got something to drink and a small snack, and sat down at a small table outside and watched the comings and goings for a little while. There was more walking alongside roads that were busy with lorries, which was rather dreary in the heat of the day, so it was a relief when the path finally turned off the road onto a path which skirted round some industrial works, through lots of bushes, with plenty of butterflies flitting about. Further on the path passed a large supermarket, and I popped in and got a toasted teakcake and pot of tea. Shortly after the super, the path finally left the road for good and headed back to the sea, where it went along a small embankment just beside the water. 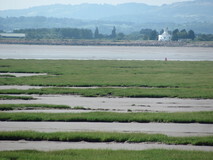 There were good views across to Somerset, and occasional sections of salt marsh. Just after Peterstone Wentlooge, I left the embankment and turned inland through a golf course to get to a small campsite, which turned out to be a pleasant spot, and very welcoming owners. It was a breezy night, so the tent was nice and dry when I packed it up in the morning, and I was back at the embankment just after seven. There were blue skies and sunshine again, and it was already quite warm. Looking back along the coast I could still the hillside of Penarth with a church sillhouetted on top of it, way off in the distance. 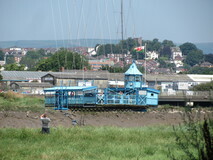 At West usk there was an old lighthouse, which had been turned into B&B. 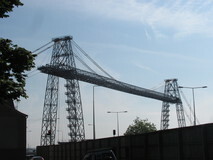 Views of the transporter bridge at Newport started to appear. The path finally left the embankment and a combination of farm tracks, small roads, and pavements alongside busier roads took me to Newport. Looking at the map the previous evening, I had been unsure about facilities on this stretch for stocking up, but the route went right past a LIDL so I stocked up on instant noodles, and a few other snack items and some drinks. The path finally arrived at the transporter bridge, which loomed over the surrounding residential streets, and there was a small cafe opposite it. The route didn't actually go across the transporter bridge though, and pushed on a bit further up the river to cross on a road bridge. It took me about an hour to get round to the other end of the bridge, including a quick stop on the way at a mobile snack bar for a couple of cold fizzy drinks. I was just in time to see the bridge in action, it was a rather impressive sight, as the hanging platform glided across the water. From the bridge the path was quite leafy, lots of bushes and plants, although various small industrial works were never far away. After a section along a cycle path, I went through a series of grassy meadows, connected by small bridges. The path emerged from the fields at the Waterloo Inn, and I nipped in and got a drink, and a baked potato with beans, plus topped up my water bottles. I got going again at about one, and crossed more fields, before soon arriving at Newport Wetland Centre, which didn't even exist on my OS map, which was a few years old. In theory it was a bit too soon to stop again, but the Wetlands Centre had a nice little visitor centre and cafe, so I succumbed and got a pot of tea, and a snack. 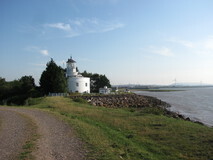 After the cafe the route did a big circuit of the wetlands, on easy gravel path, past swishing reed beds, before arriving back at the sea at the small East Usk lighthouse. The lighthouse had apparently been a lot taller when it was originally built, but had 'shrunk' over the years due to landfill being dumped all around it! 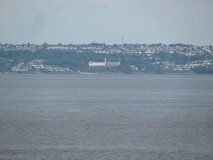 There were good views back across the river Usk to the lighthouse at West Usk which I had passed in the morning, and I could even still make out the outline of Penarth from the previous morning. 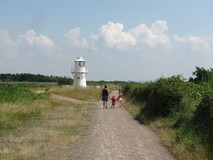 After the Wetlands Centre, the path left the shore again, and passed through a stretch of bushes that was thick with dragonflies, before popping out at Goldcliff village. It was still very hot going, and I was getting through a lot of water, so I made the short detour to the pub and had a pint of lemonade, and filled up my water bottles. I got going again at about four. A short stretch over more fields got me back to the shore at Gold Cliff, where there was a small cafe open, which I managed to resist. 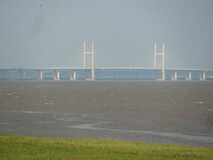 The path joined the top of the embankment again, and there were views ahead to the Severn Bridge, and the older bridge behind it. I pushed on along the embankment, it was easy going, totally flat, and fairly deserted apart from the occasional fisherman. Quite a way further along the embankment, the route left the shoreline and went inland for a while, passing near to Caldicott, and I took a short detour into the town to get some drinks and fill up with water. Near Caldicott I found a small spot to camp, not the most secluded spot, so I waited until after dark before pitching up. I got a swift getaway in the morning, and was back on the go at six. 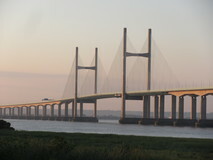 After going under the Severn Bridge, there were good views looking back to it in the early morning sun. 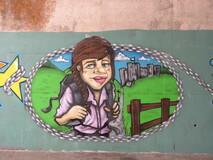 After the small headland at Sudbrook, a selection of embankments, fields and small roads got me to a subway under the M48, where there was graffiti welcoming people to Chepstow. 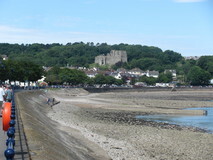 After the tunnel, some residential streets, and a few pleasant wooded sections got me to the old gate through the town wall, and shortly after that Chepstow itself. 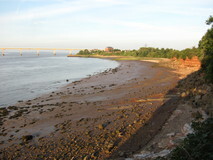 I passed by the railway station and took the short walk down to the river, to reach the official end of the entire Wales Coast Path at quarter past nine. 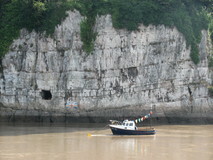 The finish was in a small grassy area, with good views of an old iron bridge, small boats moored in the river, and towering limestone cliffs on the other side of the river. I took a few photos, then walked up and had a quick look at Chepstow high street, before heading off to the railway station, for a fairly easy four hour journey back home. I found the camping opportunities along the route to be fairly good, and out of a total of 37 nights actually on the route, I managed 25 nights in campsites (ranging in price from two pounds to sixteen pounds), 2 B&Bs (near Castlemartin firing range and Barry), 1 Backpackers Hostel (Llandudno) and 9 wild camps where there wasn't much else available. A booklet of up to date B&B and campsite information like the South West Coast Path association do would be really useful though. 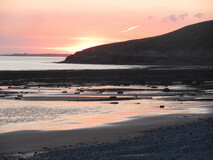 For the Pembrokeshire section, the Trailblazer guide has excellent info on campsites. Everywhere else I used a combination of Googling for campsites in each area, plus campsite icons on online OS maps give some clues. I found the signposting fairly good throughout, and I only went wrong a handful of times, usually when the signs got a bit sparse. 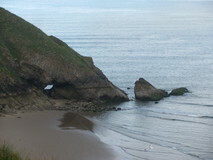 I used guidebooks for some sections (Anglesey circuit, Pembrokeshire coast path, Tenby to Swansea). For other bits I bought new OS maps which had the path pre-marked, and for some bits where I already had OS maps I marked them up with highlighter using the pdf maps on the official site. Even with guidebooks and pre-marked OS maps it is worth checking the 'Route Changes' section on the official site, as changes and new bits seem to be springing up all the time (a few of which caught me out). The official site also has a series of mileage charts for the whole route, which I found useful to carry, to give me some idea where I was likely to get to each day. I did very well for weather, over all four separate trips, and a total of 39 full days, and 2 half days, I only got rain on 9 days, and most of those were just a few hours in the morning and it was sunny again by the afternoon. All the other days were totally dry, and a lot of them hot and sunny, sometimes a little too hot. If my only experience of Wales was the coast path then I would have come away with the impression that the Wales coast is almost permanently sunny, even when there is torrential rain elsewhere in the UK! There are a lot of public loos along the coast, which are very useful for water topups (and sometimes they are the only water source). If you are using water bottles beware that some have tiny sinks that don't have enough room to get a decent sized bottle underneath the tap, so useful to carry something smaller to transfer the water across.